Beef short ribs were meant for long, slow braising at a low heat and a slow cooker may just be one of the best ways to get them to the perfect level of fall-off-the-bone doneness. After cooking away for hours in your crockpot, short ribs turn from chewy and tough to melt-in-your-mouth tender. They're a perfect winter meal—especially when served with potatoes or hot cooked noodles—and make a wonderful weeknight dinner or Sunday supper. Who can resist the temptation of slow-cooked deviled short ribs? This classic recipe includes a mouthwatering hot and spicy sauce that's made with chili sauce, chili powder, Worcestershire sauce, wine, vinegar, brown sugar, and dry mustard. Serve with French fries for a true bistro-style meal. In this sophisticated dish, savory short ribs are slow-cooked until the meat is falling apart, then smothered in a rich mushroom sauce that features sour cream and butter. Serve over boiled potatoes or hot buttered egg noodles with a sprinkling of parsley. You broil the short ribs first in this hearty recipe, so they're browned when you add them to the slow cooker. The beef is cooked with button mushrooms, carrot chunks, and a thick tomato sauce for a satisfying family meal you can serve over pasta. A combination of soy and chili garlic sauce gives these beef short ribs a sweet-salty flavor that tastes like it came from your favorite Chinese restaurant. Bonus: only a handful of ingredients are needed for this genius recipe. You may never order takeout again! These French-style boneless short ribs get loads of flavor from red wine and beef broth, mixed with packaged gravy mix, spices, and onions. Serve them over mashed potatoes with a crusty baguette for dipping into the decadent sauce. Golden mushroom soup adds a unique flavor to this tasty dish. Carrots, onions, and celery cook alongside short ribs, forming a one-and-done dinner that you can cook overnight, then freeze to enjoy later. 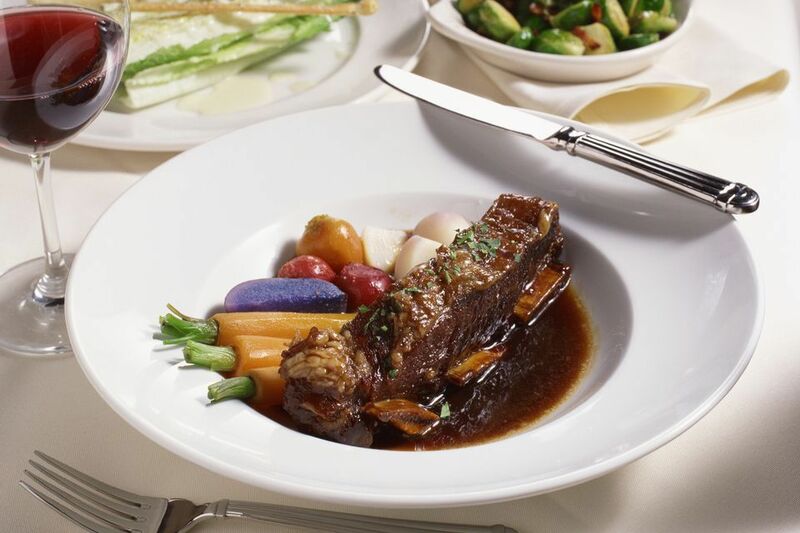 Short ribs are slow-cooked to perfection with a mixture of red wine and chopped vegetables. Serve over mashed potatoes with soft dinner rolls for sopping up the gravy. Onion soup mix and beef broth add flavor and spice to these beef ribs. They cook in your crockpot all day, ensuring that you have a filling family meal that's great for warming stomachs in the winter. Short ribs are seasoned, seared to create a crust on the meat, then braised low and slow in the crockpot with apple juice, beef broth, and pearl onions. Serve them with boiled potatoes and a tossed green salad for a comforting family meal. If you love barbecue, you'll adore this one-pot meal that makes a great Sunday dinner or Game Day meal. Short ribs cook along with potatoes, carrots, and onions in a tangy homemade barbecue sauce that you'll want to repurpose for other dishes. These tender, melt-in-your-mouth beef short ribs with mushrooms and onions are served with their delicious red wine gravy. Serve ladled over mashed potatoes, hot cooked noodles, or fluffy white rice. Hard or non-alcoholic apple cider tenderizes the meat and adds sweet flavor to these fork-tender slow cooker beef short ribs. This recipe is easy to make with just a few pantry spices and prepared gravy mix, in addition to the two featured ingredients. Pan-seared beef short ribs and chopped vegetables go into your crockpot with some chicken stock and plenty of red wine in a recipe that produces wonderfully fork-tender meat. Serve with mashed or scalloped potatoes. These beef short ribs are slow-cooked with frozen lima beans and mushrooms. Condensed beef barley soup and onion soup in the recipe add plenty of flavor to the braised meat.